Cameras roll and actors proffer gifts to the Child born to be King of Kings. With wonder and awe the child gazes upon the unusual gifts of gold, frankincense and myrrh. The expression on the child’s face is captured with dozens of camera flashes before the scene ends and the actors discard their elaborate robes. For Utah artist Liz Lemon Swindle, this is the beginning. “By studying photographs from a dramatization of this moment between the wise men and the child,” Liz says, “I am able to better understand the sacred events that brought the Holy Men to Bethlehem. Their costly gifts to Jesus were not typical presents extended to a child to make him merry. They were gifts for a ruling monarch, in reverence to his birth as King. I created this work based on Matthew 2:1-16 which describes Christ as a young child when first visited by the wise men. The scene is often portrayed in the stable but according to the Scriptures, it could have been 18 to 24 months later." "The Holy Men" is the fourth work of art to be published in the Son of Man Series. 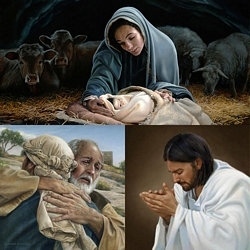 Portraits of the mortal life of Jesus Christ, from the first scene of Mary and the babe Jesus to the Holy Men — referring not only to the wise men but Jesus himself, has become the hallmark, if not the signature, of the artist.